Guiding, modeling, mentoring and supporting women toward reconnecting with their intuition, bodies, emotions and wisdom using creative processes. I teach how to make figurative, symbolic, meaningful sculptures and art that allow a woman to embrace, nurture, and connect with her feminine wholeness, wisdom and power. What happens to the meaning of a doll when she "poses" with different things? 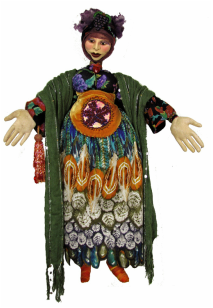 A true healing doll does not heal you; the doll simply reflects back to you your innate capacity to heal. She is a reflector, or a loving transparency. A true healing teacher does not teach you; she does not see you as inherently separate from her. She simply reflects back your own inner knowing, and reminds you of the vastness of your being. She is a mirror, a signpost. And love is the space in which all of this is possible; love heals, and we learn best in a loving field, no threat of failure, no punishment. Video of an art show at Robbin Art Gallery in Minnesota in 2010. In September 2017 I was interviewed by psychologist Gunhild Lorenzen for her online summit, Harness Your Creative Power. She is a Gestalt, Art, and Transpersonal Therapist and artist. If you didn't get a chance to see the interview or want to see it again. Barb Kobe's healing dolls transfer feelings from the inside to the outside. "She works with archetypes and concepts such as guardians, scapegoats, loving kindness, talismen and inner healers. She uses a process called visual journaling--first creating flat images with watercolor or collage to epict an emotion or a story, and then creating a three-dimensional doll or figure." "I believe that making a figure--that you can hold in your hand--will mirror some aspects of yourself. It is really more powerful and transformative than making a flat drawing." Here's an interview from 2013 when I taught at Moontree Studios in Donaldson, Indiana.